Its Christmas time once again and that means food. And lots of it! Chances are if you are entertaining this festive season or attending any gathering you will be faced with the same party favourites you have had year after year. Now you can spruce up your party and won’t be short of a dish to bring along with these festive canape recipes from Head Chef at The Lodore Falls Hotel, Shane Hamilton. 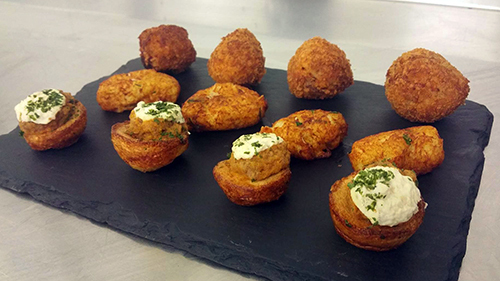 Shane has prepared 3 Canapes guaranteed to jumpstart your festive taste buds and keep your guests happy this Christmas. A great way to serve Yorkshire puddings for a party environment, you can enjoy the flavours of a Christmas roast with none of the hassle. Detailed instructions Preheat the oven to 230C/fan 210C/gas 8. Fill a muffin tray with a little oil in each section and put into oven until the oil is hot. Meanwhile, add the flour, milk and eggs into a bowl and mix until smooth. Pour into the hot tray and place back into oven for 15 minutes or until golden. Once cooked & cooled, slice the beef & place on top of the puddings and add a little dollop of horseradish. Detailed instructions Shred cooled turkey by hand or in a blender. Mix in the mashed potato, cranberries and season to taste. Mould into small balls and chill on a tray lined with greaseproof paper. Line up three bowls, one with flour, one with egg, and the last with bread crumbs. Cover the balls in the flour, egg, and then crumb. After which gently dropping them into a deep fryer for 6 minutes. Serve as a tasty canape for your guests! A fantastic fish fritter packed with flavour. A perfect addition to any party platter. Detailed instructions Place cod in a heavy based saucepan and cover with water. Slice the onion and add to the cod along with the bay leaf, then cook on a medium heat for 10 minutes. Take out the cod and set aside to cool, then add the cubed potatoes to the pan. Cook until soft, drain the water and mash the mixture together, after which gently mixing in the flaked cod, flour and breadcrumbs. Shape into fritters then chill the mixture on a baking sheet lined with greaseproof paper for 45 minutes. Deep fry the fritters and serve. So if you are inspired and keen to impress this festive season, give these 3 recipes a go. For more recipes and other great posts about events across the Lake District keep checking out our Lake District Hotels blog right here.